Everyone annoyed with the thatch in their lawn might be knowing what a dethatcher is. Yes, it is a tool used for breaking up and removing that thick layer of compressed dead plant substance in your lawn. Today, many new and existing companies have come up with so many options that everyone looking to buy a dethatcher looks confused; they don’t know whether an electric one will be good for their lawn or a tow-behind dethatcher can clean their lawn. Fortunately, you are at the right place because to help you, here is the list of top 10 best dethatchers in 2019. 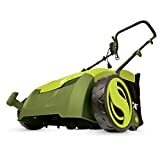 Get all the thatch removed from your small to medium sized lawns with this 12.6” electric scarifier and lawn dethatcher from Sun Joe. Equipped with a powerful 12-amp motor, AJ810E flattens a 12.6” wide path at a time. It is very easy to operate, you just need to push a button and it gets started. Moreover, it has a safety switch which prevents any kind of accidental starting. With the spring steel tines and AirBoost technology used in this dethatcher,it will pick up the thatch for you at an increased rate. This ETL approved dethatcher gives you the freedom to choose raking depth with its 5-position depth adjustment knob. If you care about the environment, dethatcher from Greenworks is for you because not evena single ounce of carbon is emitted by it;no air pollution. To provide you ultimate comfort while dethatching, this ergonomic dethatcher comes with an adjustable handle and padded grip. With its strong 10-amp motor, you can dethatch up to 14” wide path, thereby helping you to finish the task quickly. To operate this dethatcher, you don’t need any batteries or charging, just plug and go. The presence of stainless steel tines and 3-position depth control facility makes sure that you get complete control and reliable performance for a longer time. 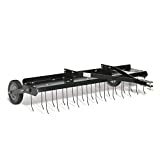 Agri-Fab 40-Inch Tine Tow Dethatcher uproots matted, dead grass and promises a thriving lawn growth. It comes with 20 resilient spring tines so that you can easily get ridof the layer of dead grass created by your mower in the lawn. With its ability to cover 40-inches wide area at a time, dethatching is done very quickly. The heat-treatment of tines make them rust-proof and give them a long-life. Equipped with a transport handle, it provides you with the facility to easily raise and lower the tines. Made in the United States, this dethatcher comes with a 3-year limited warranty. With a 48-inches weight tray and a holding capacity of up to 70 lbs., this bigger version of the above-discussed dethatcher from Agri-Fab can quickly dethatch the dead grass lying between the grass plant’s leaves and the soil. Equipped with 24 robust spring tines, it removes the thatch from your ground completely. With its semi-pneumatic tires measuring 7” x 1.5”, you can smoothly transport this dethatcher from one place to another. Moreover, its cantilever transport arm allows you to swiftly lower and raise the tines. Like its smaller version, this USA made dethatcher also offers a 3-year limited consumer warranty. If you have a big lawn and want to dethatch it efficiently, this 48-inch tow behind dethatcher from Brinly will surely help you. It has dual rows of 12 individual tines measuring 3/16” in diameteraimed to pick up maximum thatch. The dual tine rows also open the root system to collect nutrients and water. The tine tray of this dethatcher is made up of robust 14-gauge steel ensuring enhanced durability and ability to hold extra weight whenever necessary. It comes with a strong tow bar made up of steel and features universal hitch pins which fit all major models of tractors. A smaller version of the above-discussed dethatcher, Brinly DT-40BH has 2 rows with 10 independent flexing tines. Spring and fall are the seasons when maximum thatch is found in the lawns, you can use this 40-inch dethatcher to gently remove all the thatch harming your lawn. With its ergonomic transport wheels, crossing the paths and driveways is very simple. There are 3 modes to operate it and all of them can be controlled from your tractor seat. You don’t have to assemble tines on your own because they come pre-assembled, having this dethatcher means you get enough time to do other things. This is the best dethatcher in the 42-inch category. Featured with a total of 22 heat-treated steel tines in two separate lines, this dethatcher from Precision Products completely cleans the surface of your lawn when towed behind a tractor. It has a steel tow bar, and its steel tray of 12-gauge can hold an extra weight of 150 pounds. This additional weight helps in setting the tines efficiently. You can increase or decrease the height of its hitch so that it can easily fit your mower or tractor. From the tractor seat only, you can use its basic lever and two poly wheels to engage or disengage the tines. This 45-0472 electric plug-in dethatcher from Agri-Fab is specially made to save your time and efforts. This is one of the best lightweight dethatcher (weighing just 33.6 pounds) that pulls maximum dead grass from your small to medium-sized lawn without hurting any living grass. For operating it, you will need to buy an extra 12-gauge extension cord because the company does not provide any extension cord with it. With its cushioned handle, you geta comfortable and firm grip. If you are already using an electric mower, then its cord hanging around won’t bother you. This is a well-crafted machine, does exactly what it is made to do. When the spring tines are put in aggressive mode, not only the thatch is lifted, the topmost layer of the lawn’s soil is also swiftly aerated. When assembled, it measures 40” x 41” x 39” (WxDxH) and being 40” wide, it can quickly dethatch a large area of your lawn in a single move. It has wheels placed behind the tray to decrease the comprehensive width and make leveling easier. You will find that its tines are protected with safety wires and its strong tray allows additional weight. 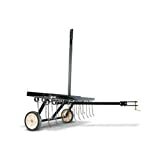 This is a 40-inch tow behind dethatcher from Agri-Fab used to dethatch dead grass and dislodge tightly packed dirt, thereby allowing room for planting. The spring tines featured in it are rust-proof and can be easily replaced. In order to attain significant durability, the tines used in it have to pass heat treatment. It is designed to gently bring matted coats of thatch and big clippings on the surface, a guaranteed healthy lawn. When used in midsummer, spring, and fall, this dethatcher brings color and life back to your lawn. It features 7” x 1.5” semi-pneumatic transportation wheels and its weight tray can easily carry up to 70 lbs. It is very important to check the material so as to avoid any kind of regrets. You need to see that the dethatcher is made from heavy duty material and it’s easy to operate as well. This will ensure that you get quality service with durability. When you think of buying a dethatcher to clean up your lawn then, it should be heavy duty. This depends on the area you want to clean. So, you should see the size of the dethatcher as it will decide the time you’ll require to clean up your lawn. It’s the user friendly nature of a dethatcher that makes it the best. You need to check to it that the dethatcher is easy to assemble and use. When you know how to assemble and use then fixing problems becomes easy. This also reduces your efforts to maintain the dethatcher for the next lawn maintenance. So, this list with top 10 best dethatchers in 2019 not only helps you in choosing the most suitable dethatcher for your lawn but also answers many common questions of people looking to buy a dethatcher for the first time. Before purchasing that perfect dethatcher for your lawn you should check its durability, find out how easy it is to use, whether its maintenance options suit you, and most importantly note that it shouldn’t be too hard on your pocket. Moreover, you should also consider the size of your lawn before purchasing.